A psychic reading with Atena offers you positive, useful, real-life insight into the actual events that are affecting your life right now. There is nothing spooky about a reading with Atena, you will receive honest, down-to-earth and empowering insight. Atena will never require you to perform rituals or spells in order to remedy any situation in your life, nor will she ever pressure you to purchase additional consultations, healings or any other services from her or anyone else. Your reading is all about you and how to attain your goals in your life. Atena offers genuine, real-life guidance that empowers you to overcome obstacles and create the results you are striving towards in the most happy and harmonious ways possible. "Personal Aura photography Readings with Atena" Find out what your aura looks like and receive a personal consultation with Atena about your aura mean to you. 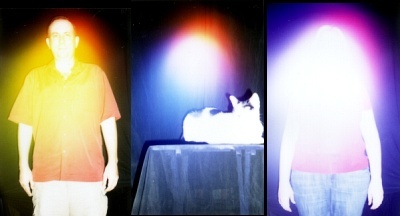 Bring your friends, your kids or your pets even some special objects of which you would like to have the aura of photographed. Atena's personal interpretation will help you understand what your aura is telling you and offer advice on shifting problem areas if any arise. ... It is like a reading except you get to keep the card! $27 for 1, or 2 for $50 ($4 off!) (Cash only) if you bring a friend! Your reading will start with a look at your general life path, we talk about what you have learned in the recent past, where you are now, what are the real issues affecting your life and what lessons you are learning through the difficulties and challenges of the present, also how you can make this path easier and more harmonious. Then we look into the near future, what your chosen path has in store for you and how you can make adjustments to get the results you are striving for. Finally we look into your distant future to see the big picture, this usually offers a little more clarity about the events and circumstances you are dealing with now. After your general life path we can look into specific issues concerning your health, finances, career or work, school or study, love and family relationships. You are free to ask questions about anything you were wondering about in any area of your life. 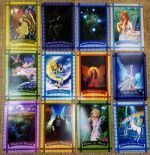 This is a comprehensive reading that takes several spreads of cards and this can take a little time. It is a good idea if you are having your reading over the phone that you take a notebook to write things down and also bring a list of questions so you don't forget after your reading start. If you choose your general life path reading, we briefly look at what the events of the recent past, then we check where you are now and what the ripple effects are that will affect the near future, and how this will affect your distant future. This is a good reading if you are looking for general guidance and not dealing with any serious questions at the moment. This reading will help keep you on track to your desires. This is a great choice if you are just looking for a little guidance in one specific issue. Simply ask your question and Atena will let you know what the cards have in store for you via e-mail or text message. 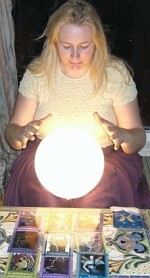 Did you know you can have your psychic reading in writing via e-mail? Order 24 hours a day, 7 days a week and enjoy the comfort of having your reading in writing so you can return to it as much as you like.